On Tuesday, March 19, my husband and I attended the “State of the City” address by Mayor Dennis Clough at the Westlake Rec Center. I found out about this event by reading it in The Observer newspaper. 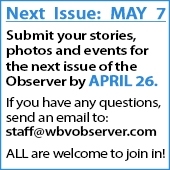 I found out our city is in “very good hands,” but I also found out that The Observer had sponsored the event and is a 100% volunteer publication. I am in awe of the talent and dedication of Tara Wendell and her father and all the other volunteers who put together such a great publication. I want to publicly thank them for their time, talent and community dedication.